Ever since it was founded in 1874, Piaget has been cultivating the spirit of luxury while focusing on creativity, concern for detail, as well as totally integrated watchmaking and jewellery expertise. Originally specializing in the development and production of watch movements, the company broadened its field of know-how in the 1960s in order to launch some amazing jewellery-watches, later followed by innovative jewellery collections. 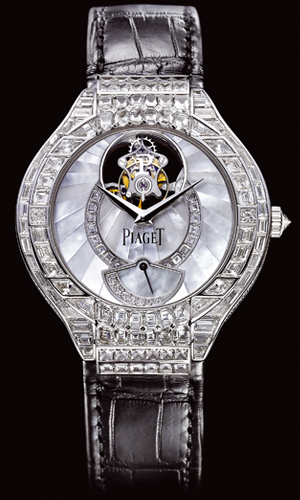 Piaget excels in all that is rare, precious and exceptional. Whether in creating the thinnest existing automatic movement or the world’s most expensive watch, Piaget applies its full range of watchmaking and jewellery-making skills to taking up new challenges. The founder’s motto, “Always do better than necessary”, still governs daily activity in its twin Manufactures based in La Cote-aux-Fees (in the Swiss Jura region) and in Plan-les-Ouates, near Geneva. Piaget captures the spirit of the times and its creations are signs of a timeless quest for technical mastery, driven by audacity, expertise and imagination. From the historic workshops in La Cote-aux-Fees to the site in Geneva, PIAGET’s craftsmen share the same enthusiasm as they bring the most audacious creations to life. Men and women skilled in over 40 crafts work together to render timeless the commitment to excellence that has been a driving force of this company for over 130 years. With complete control over its production from stamping the smallest component to the final finishing touches to its watchcases, Piaget has retained complete creative freedom guaranteeing the inspiration and authenticity of its timepieces. Today, Piaget is proud to be one of the last remaining Swiss watch “manufactures” and to have accumulated a vast range of mastery in the art of jewellery-making with specialized workshops. Confident in this inimitable wealth of expertise, the brand is facing the future with boldness and creativity, while remaining loyal to its traditional values.